Below you fill find all funeral homes and cemeteries in or near Saint Petersburg. Suburbs of Saint Petersburg: St Petersburg, St Pete Beach, Gulfport, Madeira Beach, Pass A Grille, Pass A Grille Beach, Treasure Is, Treasure Island, Home Shopping, Johns Pass, Kenneth City, N Redngtn Bch, North Redington Beach, Pasadena, Redingtn Shor, Redington Bch, Redington Beach, Redington Shores, S Pasadena, Saint Pete Beach, South Pasadena, St Pete, St Pete Bch, St Petersburg Beach, Tierra Verde. Saint Petersburg is also known as: ida, Saint Petersburg, St. Pete, Florida, Pinellas County / St. Petersburg city, St. Petersburg, and FL. Their current mayor is Mayor Rick Kriseman. Zip codes in the city: 33701, 33702, 33703, 33704, 33705, 33706, 33707, 33708, 33709, 33710, 33711, 33712, 33713, 33714, 33715, 33716, 33729, 33730, 33731, 33732, 33733, 33734, 33736, 33737, 33738, 33740, 33741, 33742, 33743, 33747, 33784. Some of the notable people born here have been: Joe Buck (sports commentator and screenwriter), Jeff Miller (politician), Tim Carter (american football player), Aveion Cason (american football player), Zach Piller (american football player), Ernest Givins (american football player), and Darren Howard (american football player). Saint Petersburg is home to the following sports teams: Tampa Bay Rays. St. Petersburg is a city in Pinellas County, Florida, United States. 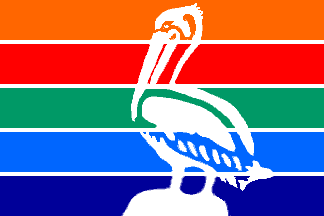 As of the 2013 census estimate, the population was 249,688, making St. Petersburg the 4th most populous city in the state of Florida and the largest city in Florida that is not a county seat (the city of Clearwater is the county seat). 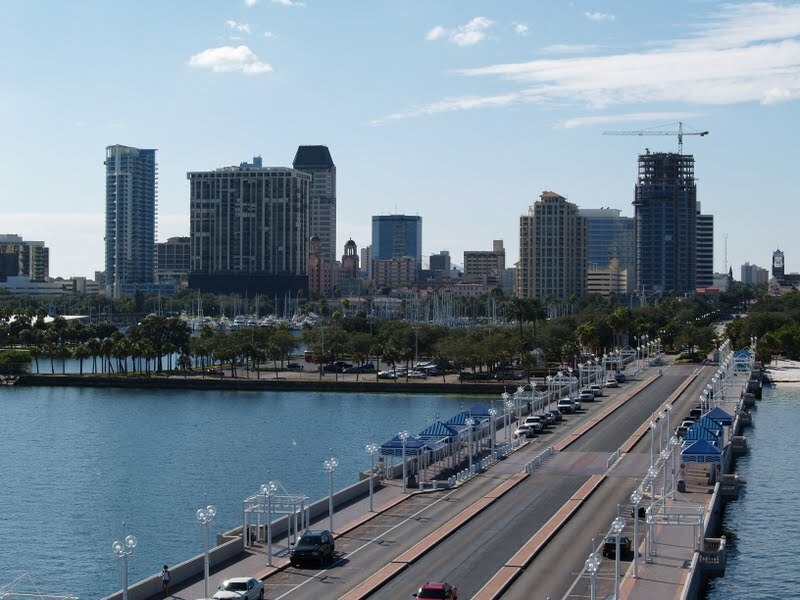 St. Petersburg is the second largest city in the Tampa Bay Area, after Tampa, composed of roughly 2.8 million residents, making it the second largest Metropolitan Statistical Area in the state. It is also a popular vacation destination for both American and foreign tourists.The city is often referred to by locals as St. Pete. Neighboring St. Pete Beach formally shortened its name in 1994 after a vote by its residents. 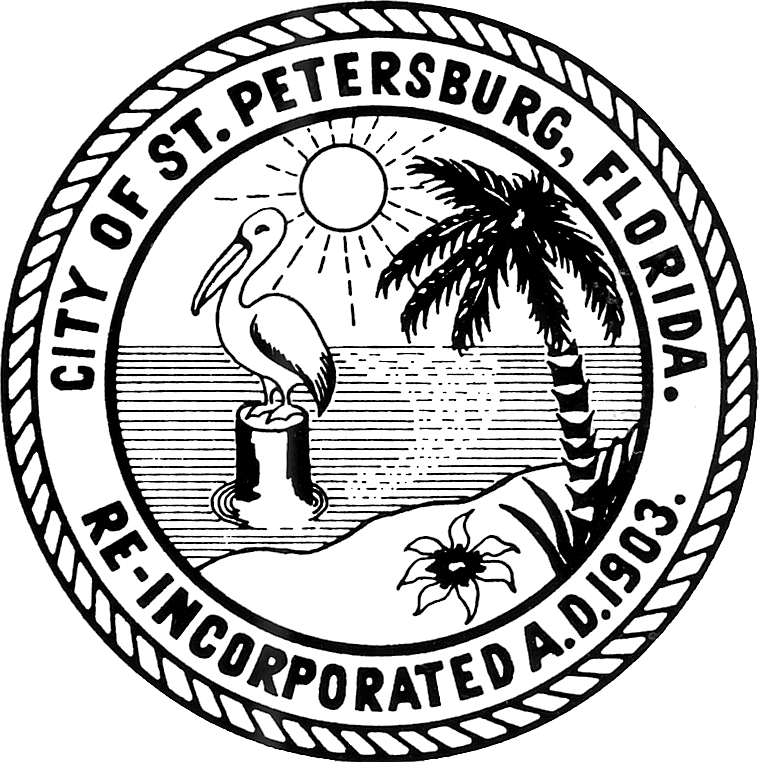 St. Petersburg is governed by a mayor and city council.The city is located on a peninsula between Tampa Bay and the Gulf of Mexico. It is connected to mainland Florida to the north, with the city of Tampa to the east by causeways and bridges across Tampa Bay, and to Bradenton in the south by the Sunshine Skyway Bridge (Interstate 275), which traverses the mouth of the bay. It is also served by Interstates 175 and 375, which branch off I-275 into the southern and northern areas of downtown respectively. The Gandy Bridge, conceived by George Gandy and opened in 1924, was the first causeway to be built across Tampa Bay, connecting St. Petersburg and Tampa cities without a circuitous 43-mile (69 km) trip around the bay through Oldsmar.With an average of some 361 days of sunshine each year, and a Guinness World Record for logging the most consecutive days of sunshine (768 days), it is nicknamed "The Sunshine City". Due to its good weather and low cost of living, the city has long been a popular retirement destination, although in recent years the population has moved in a much more youthful direction. American Style magazine ranked St. Petersburg its top mid-size city in 2011, citing its "vibrant" arts scene. It was revealed by Sarasota Herald-Tribune on August 7th, 2018 that Nicolas C Desantis passed away in Saint Petersburg, Florida. Desantis was 36 years old. Send flowers to share your condolences and honor Nicolas C's life. It was written by Sarasota Herald-Tribune on October 4th, 2017 that Tove M Stimson passed away in Saint Petersburg, Florida. Send flowers to express your sympathy and honor Tove M's life. It was disclosed on September 12th, 2017 that Lillian Violet "Lil" McCafferty (Luomala) passed on in Saint Petersburg, Florida. Ms. McCafferty was 94 years old and was born in Ashtabula, OH. Send flowers to express your sympathy and honor Lillian Violet "Lil"'s life. It was revealed on December 9th, 2016 that Robert Schallerer passed on in Saint Petersburg, Florida. Schallerer was 77 years old and was born in Battle Creek, MI. Send flowers to express your sorrow and honor Robert's life. It was written by Sarasota Herald-Tribune on July 7th, 2016 that Alison Singletary passed on in Saint Petersburg, Florida. Singletary was 79 years old. Send flowers to share your condolences and honor Alison's life. It was written by Tampa Tribune on August 15th, 2015 that Joseph A "Tampa Joe" Booker died in Saint Petersburg, Florida. Booker was 79 years old and was born in Savannah, GA. Send flowers to express your sympathy and honor Joseph A "Tampa Joe"'s life. It was disclosed on April 2nd, 2015 that Mary Jane Morgan passed away in Saint Petersburg, Florida. Morgan was 82 years old and was born in Cobden, IL. Send flowers to share your condolences and honor Mary Jane's life. It was written by Sarasota Herald-Tribune on November 23rd, 2014 that Edward J Sr Deluca perished in Saint Petersburg, Florida. Deluca was 88 years old and was born in Natick, MA. Send flowers to express your sympathy and honor Edward J Sr's life. It was reported by The Sentinel on December 6th, 2013 that John Dee Sr Anderson died in Hershey, Pennsylvania. Anderson was 74 years old and was born in Saint Petersburg, FL. Send flowers to express your sympathy and honor John Dee Sr's life. It was reported by The Sentinel on December 6th, 2013 that John Dee Sr Anderson passed on in Hershey, Pennsylvania. Anderson was 74 years old and was born in Saint Petersburg, FL. Send flowers to express your sympathy and honor John Dee Sr's life. Petersburg, Florida) Avenue in Downtown, is also named after him. A local legend says that John C. By that time, however, the population had levelled off, and has grown by only 10,000 since then; this is primarily a result of the city being largely "built-out". In 1914, fixed-wing aircraft service across Tampa Bay from St. Hibbs, 1862-1942, a native of Newport, North Carolina, established his wholesale fish business at the end of the railroad pier, which extended out to the shipping channel. Here are the results for funeral homes in Saint Petersburg Florida. You can find some of the best funeral homes businesses serving Saint Petersburg. Funerals in St Petersburg, FL on Yahoo! Local Get Ratings & Reviews on Funerals with Photos, Maps, Driving Directions and more. Listing all funeral homes in St Petersburg, Florida so you can easily send flowers to any location (same day delivery) or find any funeral service. Listing all funeral homes in Saint Petersburg, Florida so you can easily send flowers to any location (same day delivery) or find any funeral service. We work with local florists and flower shops to offer same day delivery. You will find budget sympathy flowers in Saint Petersburg here. Our funeral flowers are cheap in price but not in value.